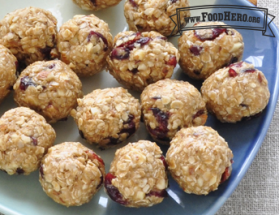 To avoid sticky fingers, keep the oat balls cool until ready to eat. In a medium bowl combine all ingredients until well mixed. Form oat mixture into 18 balls about 1 inch wide. Place balls on a cookie sheet. Refrigerate for 30 minutes. 2 Comments for "Cranberry Oatmeal Balls"
Kids hands get sticky when making this, so we used plastic gloves to avoid the food sticking to their hands! The recipe was a hit, and so easy to make. These taste like a gourmet trail mix and there are so many ways you could make them, different nuts, different dried fruits, even add a bit of coconut. Plus they take minutes to make!